The lifestyle lens - Fizzy is here to give you a captivating look. 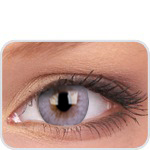 Fizzy is the latest collection of colours which are both vivid and subtle as if it?s your own natural eye colour. Add flavor to your look with 8 beautiful tones derived from natural elements. If you are having any unexplained eye discomfort, watering, vision change or redness, remove your lenses immediately and consult your eye care professional before wearing your lenses again. Worldwide shipping cost at $7.99! on all orders over $89. Delivery time: 3-15 working/business days.